Apple and Orange flavour juice. One of New Zealand’s top-selling fruit juice brands, is just as popular as ever. 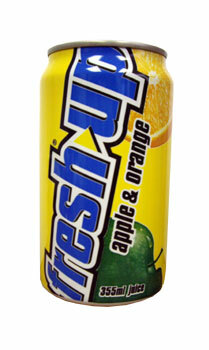 Fresh Up refreshes and revives sporty and outdoorsy Kiwis who love natural energy. Available in a range of delicious, apple-based variants, Fresh Up is a crisp, refreshing fruit juice whose popularity knows no bounds. Reconstituted Fruit Juice (Apple Juice (80%), Orange Juice (20%), Vitamin C)), Flavour. ....than a true taste of home to quench a thirst!